"AMY!!!! HAVE YOU CHECKED YOUR EMAIL?!" . . . I think I might have even yelled it . . . in a late night ecstatic phone call to my business partner EXTRAORDINAIRE ~ Amy Enderle ~ whom we discovered had just won FIRST PLACE in the "emotion" category of WPJA's 4th Quarter photo contest. First, the contest is only open to members of WPJA (Wedding Photojournalist Association), and membership is NOT automatic. Photographers must apply for admittance because WPJA wants to ensure its members truly take a photojournalistic approach to weddings. Then each award category receives hundreds of entries from photographers all over the world. To even PLACE in a category is an honor. To actually get FIRST PLACE?! INCREDIBLE! But as ecstatic as we are over Amy's recognition, making the picture was really secondary to making the moment possible. So here's the back story: Andy's grandmother had never missed a single one of her grandchildren's weddings. When she was admitted to the hospital just before Andy & Rachael's wedding, they told Amy: "We really want to see her on our wedding day." So Amy said, "Let's make it work while you're in your wedding clothes." They made last minute changes to the itinerary. Amy drove Rachael to the hospital where Rachael and Andy had a private moment with each other before stepping into his grandmother's room. The hospital requested that only family be in the room, and so Amy documented this moment, along with their smiles and laughter, from the doorway. JUDGES COMMENTS: I wish there was a caption on this image especially. Very touching. Nicely done. Straight forward approach with lens and light made it work. This picture was very moving and brought an instant emotion of sadness to me. It is not necessarily the hardest picture to capture but the moment, the emotions, and the scene is what separates this photo from the rest. 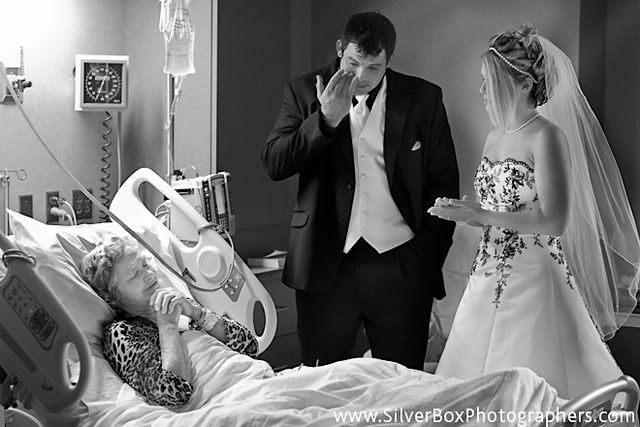 Beautifully composed photo with sensitivity of an unexpected moment where the bride and groom visit what appears to be an ailing grandmother in the hospital. This is a very powerful picture, very moving, this is the reason people want photojournalist style wedding pictures. I think an emotion picture should make you feel something and this nails it. What an amazing opportunity the photographer had to witness something so profound. The photographer took it one step further and followed the bride and groom to the hospital to visit someone close to them. There is joy and sadness in this photo. It stood out from all the rest. Amy, you DO stand out from all the rest. I'm so proud of you! the world view of a 7 year old . . .